Fold open and type. Fold closed and go. With this convenient fold-up keyboard and stand, you can type and take notes more comfortably from meeting to meeting, class to class, or wherever you go with your iPad 2. 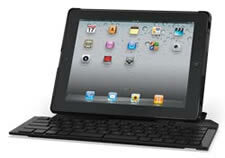 Images of iPad, keyboard and case are for demonstration purposes only. Actual product may vary slightly. iPad sold separately. 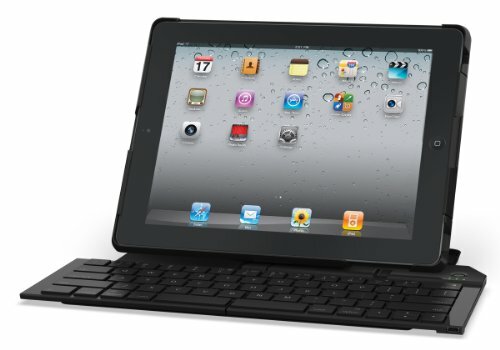 Works with your Smart Cover for extra protection and style wherever you take your iPad 2. Which Logitech iPad Accessory Is Right For You? It's the perfect clip-on travel speaker for your iPad—small enough to slip in your backpack or briefcase, full stereo sound, quick connection and long playtime from a rechargeable battery. It's a portable workstation for your iPad with a compact wireless keyboard, tablet stand and carrying case so you can enjoy comfortable typing and laptop-like viewing around the house and away from home. It's an all-in one stereo speaker, adjustable pedestal stand and charging station for your iPad that's easy to move all around the house. It's an all-in-one protective aluminum travel case, compact Bluetooth wireless keyboard and stand—so you can go from email to Face Time in no time and take along your iPad without worries. It lets you listen to everything on your iPad, iPhone or iPod Touch in full, rich stereo sound—wirelessly from across the room. It's a roomy full-size keyboard and built-in stand that folds flat to tablet size and folds open for comfortable typing everywhere you use your iPad2.